Classic pergola style, with a more open design, taller/un-notched roofing system. Base price range: $1,740-5,750 for standard sizes. Freestanding and attached. Custom sizes and pricing available. Sizes are listed as Rafter Length (Projection) x Beam Length (Width). More details below. We ship FREE anywhere in the contiguous United States. Pergola kits ship from our facility within 10 business days. 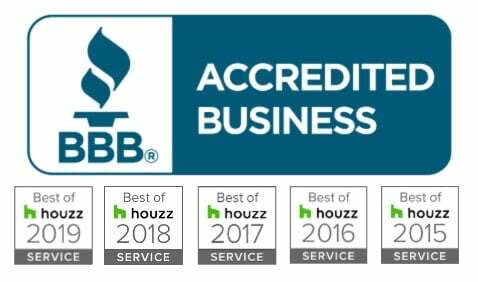 Click here to get a customÂ quote! Like the timeless hat, our Fedora Pergola Kit is simple and stylish. 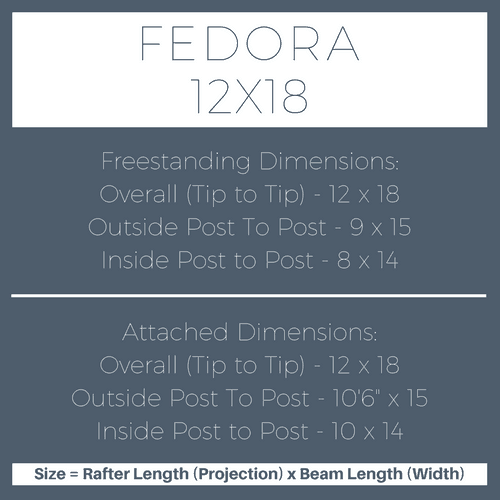 The Fedora is the perfect choice if you’re looking to frame an outdoor patio with style and create an open feel that still allows some sunlight and breeze to float through. We have upgraded the standard design to include 2×8 rafters, 2×8 beams and beefy 6×6 posts, and now offer 90 standard sizes ranging from 8×8 to 20×20 in freestanding and attached versions. The Fedora pergola kit comes standard with 6×6 posts, double 2×8 beams, 2×8 rafters, 2×2 top slats and stainless steel hardware. The rafters are un-notched and configured in 3 sets of 2 for sizes 8×8 to 15×15, or 4 sets of 2 for larger sizes. All standard sizes of Fedora wood patio covers with rafters 8′-15′ include 8 top slats. All standard sizes of Fedora wood patio covers with rafters 16′-20′ include 10 top slats. As with all of our pergola kits, we are happy to customize a Fedora to your specifications. If you’re looking for a bit more coverage, consider our Big Kahuna freestanding or attached pergola kit or our Sombrero freestanding or attached pergola kit. 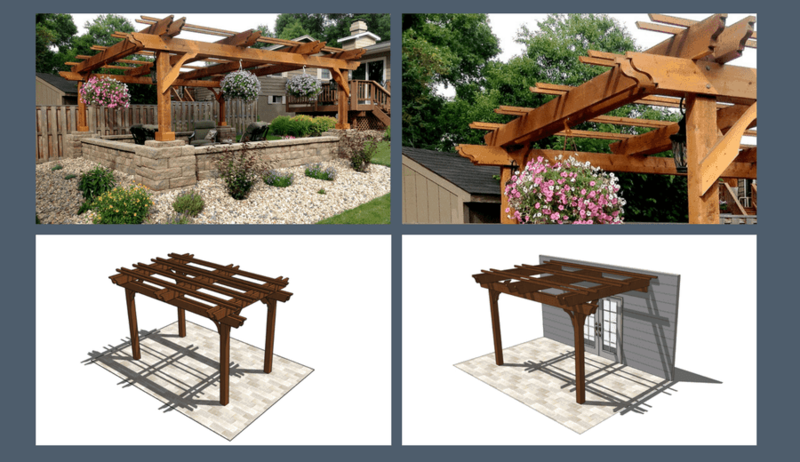 Want to see other pergola styles? See all pergola styles and read our pergola kit comparison.